Today I made a batch of Challah, three loaves. I used instant yeast, which is what I had on hand, so I adjusted the recipe as I've been taught. That part worked just fine. The dough was mixed, fermented, shaped (rather nicely, I might add) and proofed. Based upon the result, I think I am still underproofing. 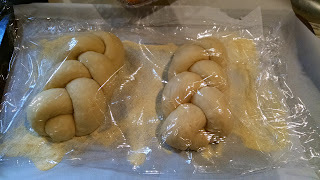 The braid split apart at the top. 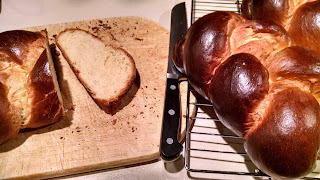 However, it's much closer to the proper result than last week's brioche. It's a nice even golden brown and the inside texture is nice. I'll keep practicing. I took photos as I went along in an effort to be able to recognize when the loaves were fully proofed. I guess that didn't help enough. So, per chef, potentially underproofed and possibly the oven was too hot. Also, I didn't mix it exactly as we had in class, so try again but stick to the 2-step mixing method.